I’ve had a little person on my shoulder since April telling me to dare greatly. Try it! Say the hard thing! Be you! Be Brave! Speak your truth! Listen! Maybe it’s Brene Brown? Maybe it’s my authentic self? Whoever she is, I like her and hope she keeps encouraging me. I highly recommend reading Daring Greatly, unless you’re someone who already lives every moment comfortable in vulnerability, takes risks and loves fully. If you’re that person, please write a book (or mentor me or guest blog here or…). If I had the time, I could probably write for days on this subject and about this book. I’d love to model brave and daring experiences for my kids. I’d love to be as open as possible to what the world is offering me. It reminds me of my first panic attack. I was listening to someone playing the piano, it moved me, the person playing made eye contact with me. Now I have the words to say that I felt broken open with vulnerability at that time. I learned about Dr. Kristin Neff, a researcher at University of Texas, studying compassion. If you’re interested you can take her self-compassion inventory. Maybe her book will be a future focus of this blog? I had been using a post-it note as a bookmark while reading Daring Greatly and about 100 pages in, I grabbed an bookmark that was from an old O magazine and kept reading. As I placed my bookmark, I did a double-take to carefully read the quote on it: “Those who are willing to be vulnerable move among mysteries” -Theodore Roethke. A mystery, indeed. Love that message! I’m listening and feeling open and vulnerable to whatever is next. Since starting this book, we have witnessed the Boston marathon, the explosion in West and the tornado in Moore. This Daring Greatly quote seemed very timely. “After doing this work for the past twelve years and watching scarcity ride roughshod over our families, organizations, and communities, I’d say one thing we have in common is that we’re sick of being afraid. We want to dare greatly. We’re tired of the national conversation centering on “what should we fear?” and “who should we blame?” We all want to be brave.” I’d like to honor heroes that were daring greatly during these events and the victims/family/loved ones that are meeting new challenges every day. I was hoping to have some pictures of my newly framed photos to share with you all but I can’t find the pictures I ordered to put into the frames! I’m sure they’re around here somewhere… Anyways, proof of my progress coming soon! I’m so excited about my April resolution: daring greatly. I kept hearing about Brene Brown’s book Daring Greatly and then I saw Oprah’s Super Soul Sunday interview with her and knew that this was a book I needed to read. Of course, I’d love for you to join me in reading this book and daring greatly in your life, if you feel so inclined. 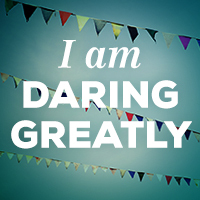 My daring greatly starts tomorrow when I board a plane- eek! Happy April!